Across the United States, millions of people are living with diabetes, and some don’t even know it. More than 30 million people have been diagnosed with types 1 and 2 diabetes. At the same time, 7.2 million people are living with undiagnosed diabetes. In the past 30 years, the rate of diabetes diagnoses has become a national health crisis. With 9.4 percent of the U.S. population living with the disease, the need for healthcare professionals to help has grown exponentially. The medical professionals who help diabetic patients monitor and manage their condition are known as diabetes management nurses. They provide information to patients and, in some cases, the patient’s family members, to help them make educated health decisions with a goal of diabetes self-management. Diabetes management nurses also interact with physicians to provide ongoing information about the patients. Many diabetes management nurses are family nurse practitioners (FNPs) who work with endocrinologists to care for diabetic patients. In the role of diabetes management nurse, healthcare providers can help patients fight the disease. To become an FNP and a diabetes management nurse, registered nurses (RNs) will first need to earn a Master of Science in Nursing (MSN) such as the one offered online by Duquesne University. There are other necessary skills as well. Analytical skills: Diabetes management nurses must process and analyze patient information to make appropriate adjustments for diabetes care. This includes changing insulin dosage, prescribing thyroid medication, adjusting target blood glucose goals, and updating insulin-to-carb ratios. Communication skills: Diabetes management nurses should be able to clearly communicate any treatment changes to patients, other nurses, and doctors at their practice. Attention to detail: Even the slightest changes in blood work or blood glucose levels can have a huge impact on overall a patient’s well-being, so diabetes nurses must closely monitor health trends. Interpersonal skills: Diabetes management nurses frequently discuss patient information and treatment methods with patients and other healthcare professionals. They should be able to do so in a tactful and professional manner. Leadership skills: Being able to direct other nurses and medical staff in the treatment of patients is key for diabetes management nurses, especially those in leadership positions who directly influence the decisions and actions of other nurses. Broad knowledge base: Most newly diagnosed diabetic patients will have lots of questions about their condition. Diabetes management nurses should be able to provide patients with disease-management instructions and answer diabetes-related questions about insulin delivery and blood sugar management. Patient education: By teaching patients about their disease, diabetes management nurses prepare patients to handle it on their own. These self-management lessons are especially important for Type 1 diabetics because many Type 1s are diagnosed as children. Nutrition therapy: Diabetes nurses often recommend nutrition therapy to treat Type 2 diabetics because the condition is frequently caused by unhealthy dietary choices. For both Type 1 and 2 diabetics, a healthy diet can help keep blood glucose levels stable and reduce the risks for hyperglycemic (high blood sugar) or hypoglycemic (low blood sugar) episodes. Medication: Diabetes nurses manage the condition by prescribing insulin, a hormone that helps regulate blood glucose levels. Type 1 diabetics are insulin dependent and are prescribed insulin in varying doses, either via daily syringe injections or through the use of an insulin pump. Type 2 diabetics have the option of taking insulin orally. Payscale.com said FNPs who are certified as diabetes educators earn a median salary of $102,249, as of August 2017. Earners on the low end made around $65,436, while those at the top made up to $139,061. Diabetes management nurses practicing with endocrinologists and other physicians tend to work during regular business hours. The BLS projects the employment of all nurse practitioners – including FNPs specializing in diabetes management – to grow by thirty-one percent by 2024. 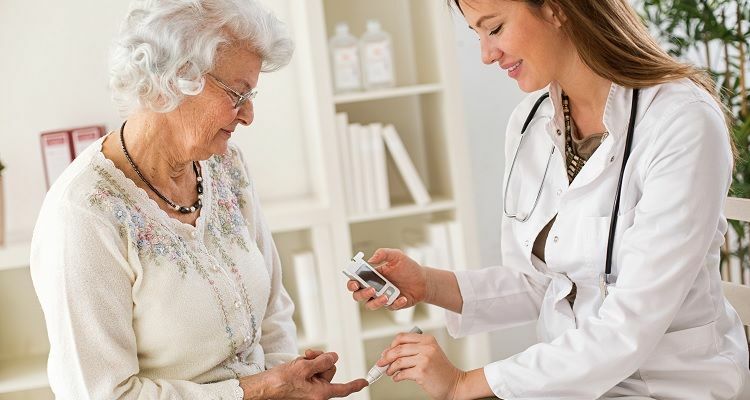 With the number of patients diagnosed with diabetes increasing each year, there will be no shortage of patients requiring the services of diabetes management nurses. For nurses who want to enter a well-paying, secure job while making a difference in the lives of diabetic patients, a career as a diabetes management nurse is an ideal choice. The Duquesne University School of Nursing is top ranked in U.S. News and World Report’s 2017 Best Online Graduate Nursing Programs. The online MSN program offers registered nurses the opportunity to advance in their careers and play an even greater role in providing healthcare services. MSN specializations include forensic nursing, nursing education and faculty role, and family nurse practitioner. For more information, visit Duquesne University’s MSN program website.